Maximum obsolescence or digital permanence? Raimo is in charge of program/concept developement in TV, radio, web and transmedia. Additionally he leads the developement of professional training in feature journalism, docs, reality, drama and transmedia creation. 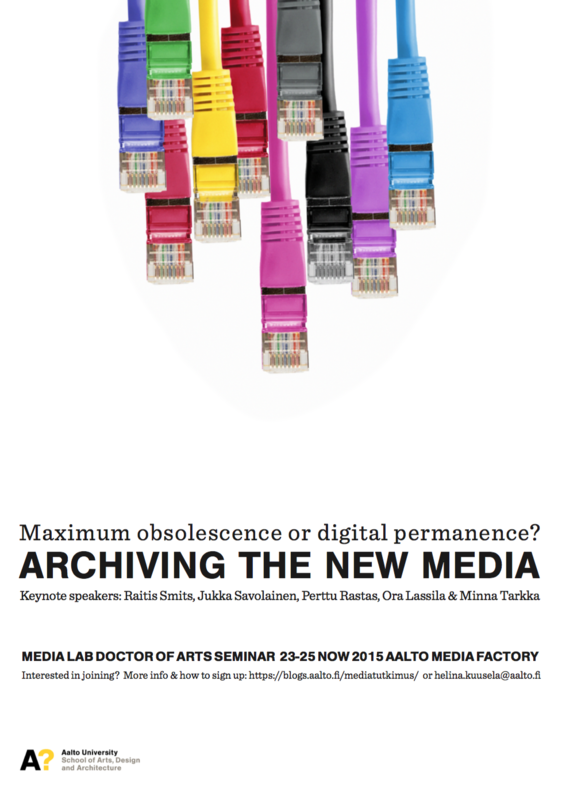 The seminar is open to Doctor of Arts and advanced Master of Arts students at Aalto University. Please send a 300 word abstract of your project or topic with your contact information and coordinates to Helinä Kuusela (helina.kuusela@aalto.fi) no later than 19th Nov 2015. This entry was posted in Conferences, New Media, Practices, Science, Seminars, Symposium, Theory on October 22, 2015 by Helinä Kuusela.